Turnberry Towers is a 45-story twin tower condominium complex located on the North end of the Las Vegas Strip. The property developer was Turnberry Associates, known for their luxury condominium towers in Miami. The dual towers include 636 residences and the project was completed in 2008. Elevated high above the Las Vegas strip, these functioning one-to three-bedroom condominium residences range in size from approximately 814 square-feet to 1657 square-feet and feature custom details, natural stone finishes, terraces, and some of the most vibrant views of the Las Vegas Strip and the Las Vegas Country Club Golf Course. Turnberry Towers residents enjoy exclusive amenities which include private and valet parking, a pool complex which offers a resort-style experience with two waterfalls, cabanas, outdoor cooking stations, fitness center, tennis courts, conference room, social and media room. Spanning 13 acres, the grounds at Turnberry Towers are some of the largest in the high-rise segment. 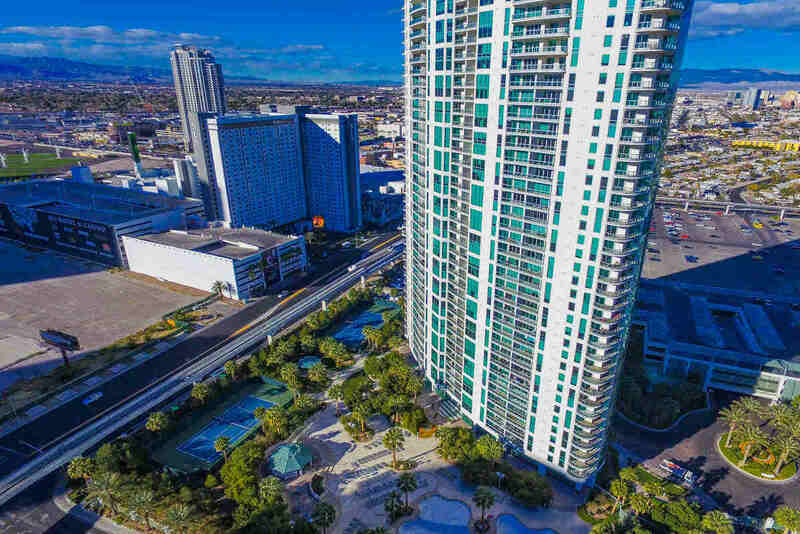 Contact us today to schedule a tour of residences that are for sale at Turnberry Towers Las Vegas.